For other uses, see Loch Ness (disambiguation). Loch Ness (/ˌlɒx ˈnɛs/; Scottish Gaelic: Loch Nis [l̪ˠɔx ˈniʃ]) is a large, deep, freshwater loch in the Scottish Highlands extending for approximately 37 kilometres (23 miles) southwest of Inverness. Its surface is 16 metres (52 feet) above sea level. Loch Ness is best known for alleged sightings of the cryptozoological Loch Ness Monster, also known affectionately as "Nessie". It is connected at the southern end by the River Oich and a section of the Caledonian Canal to Loch Oich. At the northern end there is the Bona Narrows which opens out into Loch Dochfour, which feeds the River Ness and a further section of canal to Inverness, ultimately leading to the North Sea via the Moray Firth. 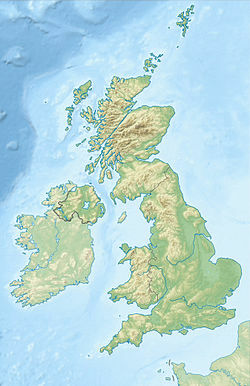 It is one of a series of interconnected, murky bodies of water in Scotland; its water visibility is exceptionally low due to a high peat content in the surrounding soil. Fort Augustus, Invermoriston, Drumnadrochit, Abriachan, Lochend; Whitebridge, Foyers, Inverfarigaig, Dores. At Drumnadrochit is the "Loch Ness Centre and Exhibition" which examines the natural history and legend of Loch Ness. 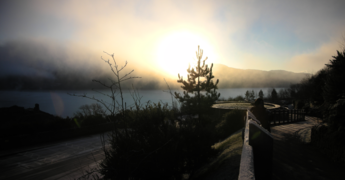 Boat cruises operate from various locations on the loch shore, giving visitors the chance to look for the "monster". Urquhart Castle is located on the western shore, 2 km (1.2 miles) east of Drumnadrochit. Lighthouses are located at Lochend (Bona Lighthouse) and Fort Augustus. Loch Ness is known as the home of the Loch Ness Monster (also known as "Nessie"), a cryptid, reputedly a large unknown animal. It is similar to other supposed lake monsters in Scotland and elsewhere, though its description varies from one account to the next. Popular interest and belief in the animal's existence have varied since it was first brought to the world's attention in 1933. There is an RNLI lifeboat station on Loch Ness, which has been operational since 2008. It is manned by voluntary crew with an inshore lifeboat (ILB). The following fish species are native to Loch Ness. A number of others such as perch and roach have been introduced in the Loch or Caledonian Canal with various levels of success. There was formerly a second island (Dog Island) which was submerged when the water level was raised during the construction of the Caledonian Canal. Loch Ness serves as the lower storage reservoir for the Foyers pumped-storage hydroelectric scheme, which was the first of its kind in the United Kingdom. The turbines were originally used to provide power for a nearby aluminium smelting plant, but now electricity is generated and supplied to the National Grid. Another scheme, the 100 megawatt Glendoe Hydro Scheme near Fort Augustus, began generation in June 2009. It was out of service between 2009 and 2012 for repair of the tunnels connecting the reservoir to the turbines. Loch Ness lies along the Great Glen Fault, which forms a line of weakness in the rocks which has been excavated by glacial erosion, forming the Great Glen and the basins of Loch Lochy, Loch Oich and Loch Ness. Loch Ness looking south, taken in May 2006. John Cobb died in an attempt at the water speed record when his boat Crusader struck an unexplained wake on the surface of the loch in 1952. His accident was recorded by the BBC reporters on site at the time. Nearby, there is a memorial to him erected by the people of Glenurquhart. On 31 August 1974, David Scott Munro, of Ross-shire Caberfeidh Water Ski Club, became the first person in the world to water ski (mono ski) the length of Loch Ness. From Lochend to Fort Augustus and back, he covered the 77 km (48 miles) in 77 minutes at an average speed of 60 kilometres per hour (37 mph). In July 1966, Brenda Sherratt became the first person to swim the length of the loch. It took her 31 hours and 27 minutes. ^ Dill, W.A. (1993). Inland Fisheries of Europe, p. 227. EIFAC FAO Technical Report 52 suppl. ^ "Bathymetrical Survey of the Fresh-Water Lochs of Scotland, 1897–1909". National Library of Scotland. Archived from the original on 2007-02-08. ^ a b "Ness, Loch". 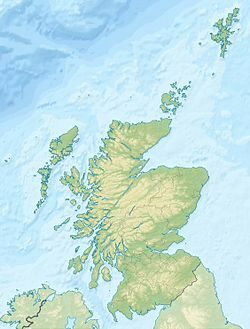 The Gazetteer for Scotland. Retrieved 2010-02-09. ^ "A new hideaway for the Loch Ness monster? Skipper claims to have uncovered deepest crevice yet". The Telegraph. Retrieved 2016-03-04. ^ "The Loch Ness Centre". ^ Nessie, Legend of. "The Legend of Nessie the Ultimate Loch Ness Monster Site". www.nessie.co.uk. Retrieved 2016-02-28. ^ "RNLI is heading inland with Loch Ness Lifeboat". The Herald. Glasgow. 28 March 2008. Retrieved 5 February 2018. 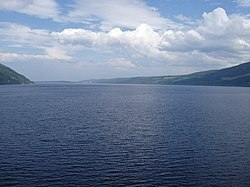 ^ Loch Ness Information site: The Fish and Invertebrates of Loch Ness. Retrieved 24 March 2015. ^ a b Blundell, O. (1909). Proceedings of the Society of Antiquaries of Scotland (PDF). 43. pp. 159–164. ^ "Glendoe Hydro scheme". Scottish and Southern Energy. Archived from the original on 2007-08-28. Retrieved 2007-08-28. ^ "Hydro-electric scheme's dam close". BBC. 2008-09-01. Retrieved 2010-02-09. ^ Piccardi, Luigi (2014). "Post-glacial activity and earthquakes of the Great Glen Fault (Scotland)" (PDF). Memorie Descrittive della Carta Geologica d’Italia. 96: 431–446. ^ "Loch Ness could become testing ground for world water speed record 64 years after tragedy". Daily Express. March 28, 2016. Retrieved January 19, 2018. ^ Gallacher, Terry. "Loch Ness 1966". Retrieved 24 May 2012. ^ Press & Journal newspaper. Inverness edition. 2 September 1974. ^ "Brenda Sherratt's Birthday Swim To Remember". Open Water Swimming. Retrieved 2017-02-11. Look up Loch Ness in Wiktionary, the free dictionary.